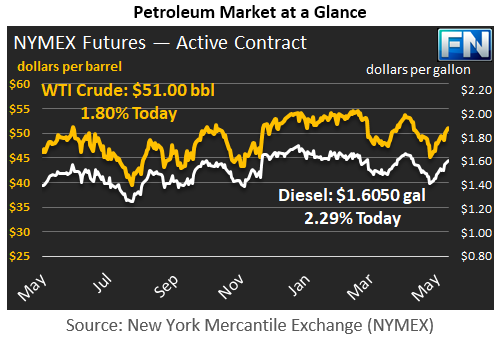 WTI crude prices reached $51.00/b this morning, after continuing their upward trend on Friday. Friday’s market closed at $50.33/b, a gain of $2.48 over the course of the week. WTI opened at $50.60/b today, a major jump of $1.32, or 2.68%, above Friday’s opening price. Current prices are $51.00/b, an increase of $0.67 above Friday’s closing price. Diesel opened at $1.5888/gallon this morning. This was a major increase of 4.55 cents (2.95%) above Friday’s opening price. Current prices are $1.605/gallon, an increase of 2.23 cents above Friday’s closing price. 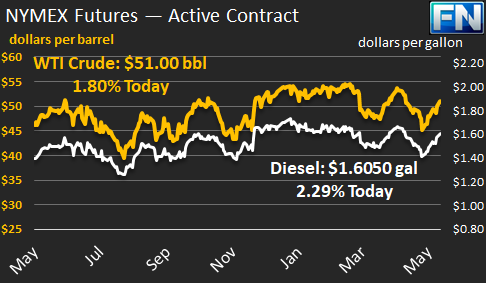 Gasoline opened at $1.6549/gallon today, which, like diesel, was up significantly from Friday’s opening price—a jump of 4.76 cents, or 2.96%. Prices are $1.6666/gallon currently, an increase of 1.43 cents above Friday’s close. Last week, OPEC and non-OPEC oil producers started meeting in earnest to hammer out details of an extension to the production cuts. Saudi Oil Minister Khalid Al-Falih announced that all of the original participants in the cuts are on board for an extension. The group is proposing a longer-term cut that will extend into 2018 and possibly go deeper than the original cuts, and may include one or two new participants as well. The OPEC-NOPEC group is working toward cementing their agreement in the next few days, so that the formal meeting on May 25th will be a rubber stamp. The market is showing more faith that the OPEC-NOPEC group will be able to drain some of the excess global crude inventory. The low prices in 2016, plus a slight reduction in net exports, resulted in a significant drop in oil export revenues. The U.S. Energy Information Administration (EIA) calculates that OPEC net oil export revenues declined to $433 billion in 2016, the lowest level since 2004. According to the EIA analysis, 2016 revenues were 15% below the $509 billion earned in 2015. With 2017 prices slightly higher, the EIA forecasts that OPEC’s net oil export revenues will rise to approximately $539 billion dollars (nominal) in 2017. The EIA’s analysis is presented in our second article today.